What an amazing trip! Belize is everything I remembered - and more! The people, the colors, the smells and sounds all combine to create a true rainbow nation. This is not going to be a travelogue (which would end up being an entire book). I am going to just highlight what really stood out for me. What the differences are and what has remained the same as when I visited 16 years ago. The first big difference was of course, seeing the country from the water rather than driving it. Flying down to Placencia from Belize City to pick up our boat, although that day was a bit cloudy, showed me a bird's eye view of the coastline we had driven before. The numerous lagoons and the water - oh, the water! The colors! A million shades of turquoise and blue creating a tapestry below us. Tiny cayes dotted the tapestry and the mangrove-lined coastline popped in and out of the clouds. As we neared Placencia, our home base, I noticed the development along the shore which 16 years ago was almost completely uninhabited. Resorts and private homes; new marinas carved out of the mangroves. Progress, I suppose? Our Tropic Air twin puddle-jumper came in low and slow into the dirt runway (a new international airport is being built a bit north of there) and we unloaded our gear for the short trip by cab to the Paradise Resort where we spent the first night. And I got my feet and bod into the silky Caribbean water, exactly as I remember it. Soft, warm, refreshing, salty. A group of little girls were playing on the dock and when I joined them, I was reminded of my youth. These kids are not taught to fear people, but to embrace them. They wanted to talk and have their picture taken, strutting and posing without a parent in sight. Then, of course, one of them wanted to take a picture of me with the rest of them! Very cute! I jumped in and we floated around in the shallow water as they chatted and giggled before rushing off to get dressed for a birthday party. How refreshing! Not just the water, but the kids as well. The boat, a 48 foot Moorings catamaran, incidentally built by Camper and Nicholsons in Cape Town, was amazing, providing a perfect platform for exploring the reef. Shallow draft, beamy, room for all 9 women aboard to live together for a week. And almost brand new, not even a year old! So we were very spoiled in that regard. I was the only one who had visited Belize previously, so for the others, it was a new world to discover. And for me to rediscover. 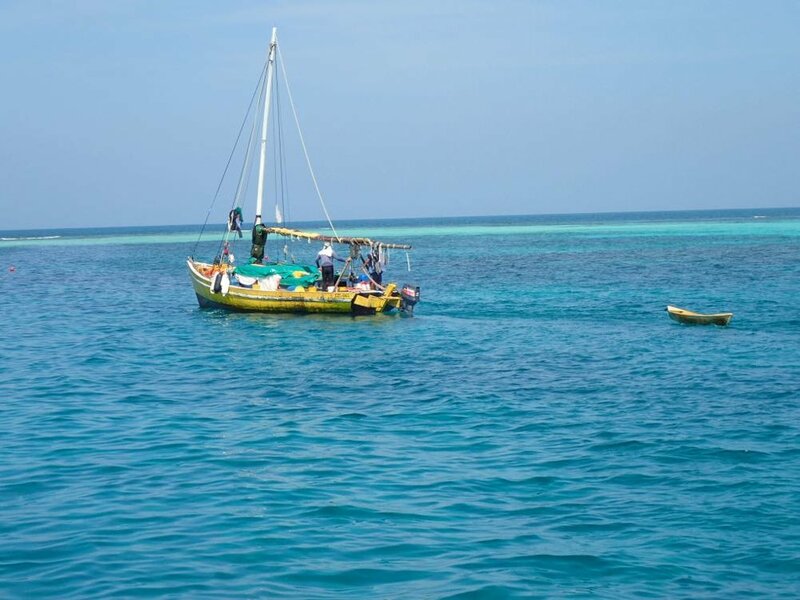 Our daily plan (Betsy as skipper and me as first mate) was to sail a few hours, find an anchorage or pick up a mooring early in the afternoon and spend the rest of the day snorkeling, swimming, paddle boarding and kayaking. The Belize Barrier Reef Reserve System is the second largest barrier reef in the world and was inscribed as a World Heritage site in 1996. Belize has strong environmental policies throughout the country, a good thing or the country would be ruined. As it is there is probably a lot of backhanding going on with the amount of development being allowed along the shoreline where it looks like the mangroves are being indiscriminately removed for marinas and resorts. But on the reef itself due to its UNESCO state, we didn't see much new being developed. We didn't get to to Tobacco Caye, which was the only caye I visited last time, but listening to comments from the locals, it has remained the same, still very Belizian. We had two NOAA girls onboard, who were impressed with the conditions of the coral and it was obvious from Eyanicke, our guide who took us into Queens Cayes Reserve, how proud and careful they are of the reef. We were allowed to be in the water and swim with spotted eagle rays, nurse sharks and turtles! I especially enjoyed the old loggerhead turtle who owned the place! Apparently, he has been known to nibble toes so we were all a bit cautious around him but managed to remain digitally intact! Talking digital in another sense, we were pretty much cut off from the world, except for VHF radio contact with the base (sometimes) and WiFi as some of the resorts. None of us had opted for an international cell plan so contact with the rest of the world was quite limited. Forced withdrawal! But the proliferation of mobile devices was a big change I noticed, but that phenomenon is not limited to Belize! Belize has been getting a bad rap recently. Before we left on the trip, people were saying things about how scary the place is, how dangerous etc., etc, etc. I am pretty sure that in areas of the country, just as there are areas of all countries, that it isn't wise to visit. But for our group and on this trip, I never felt a sense of fear around anywhere we went or anything we did. We had agreed ahead of time to use a buddy system, always go with someone, be aware of the surroundings. These precautions are universal, especially for women. We never experienced any intimidation or anything negative. In fact, the most impressive thing about Belize, for me anyway, was how friendly, kind, accommodating and considerate the local people are. Our drivers, guides, wait staff, hotel staff, in fact almost everyone we had any interaction with, made our visit memorable. And that has not changed from when I visited before. For instance, Betsy and I were lucky enough to get Troy from Belize Shuttles, the same shuttle driver from Maya Mountain Lodge (more on MML in another post) who had delivered us there from Placencia four days earlier. As we had a bit of time on our hands before our flight home, we mentioned we wished we could visit the rum distillery in Belize City, and lo and behold, he made that happen! It was a very quick visit, but he did not have to do that! The whole experience reaffirmed my belief that people are naturally good and that I would still jump at the opportunity to live there. I wonder if 78 Front Street in Punta Gorda is still available? Older PostThis Time Tomorrow - Belize!